Here is a breakdown of info for some of the cast members. John Boyega is best known for his role on the awesome indie hit Attack the Block. He’s also currently filming 24: Live Another Day. Adam Driver has been coming up quickly over the past couple of years in a number of critically successful dramatic films including Inside Llewyn Davis, Frances Ha, and Lincoln. You also probably know him from HBO’s Girls. Daisy Ridley is a relative unknown. 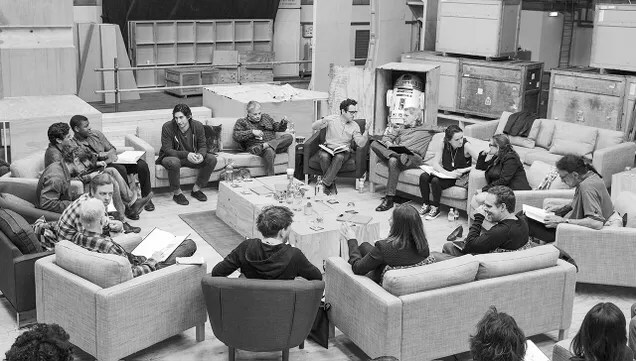 Having worked mostly on television in the UK (and the upcoming horror movie Scrawl), Star Wars VII will be Daisy’s first major motion picture. A veteran actor, Oscar Davis is best known for roles in Drive, Sucker Punch, and Ridley Scott’s Robin Hood. He also earned a Golden Globe nomination for playing the title character in last year’s Inside Llewyn Davis. An Irish actor best known for playing Bill Weasley in the Harry Potter series of movies, Domhnall Gleeson also starred in last year’s romantic, time-traveling movie About Time. Thanks to awesome motion capture technology, Serkis has been Gollum, King Kong and that super smart Chimp from The Planet of the Apes. Max Von Sydow has been making movies since the 1950’s. His best include, Flash Gordon, The Exorcist, Minority Report, and Shutter Island. Mark Hamill, Carrie Fisher and Harrison Ford are back to take on the roles that made their careers.